The ultimate 6-in-1 power tool featuring jigsaw, circular saw, sander, lathe, drill and table vice. 3 great projects to complete. Make a jet plane, castle and pirate ship. 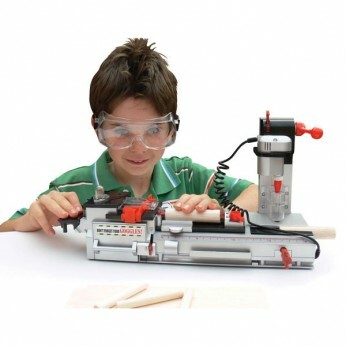 Includes safety goggles, instruction booklet, paints, glue, 2 brushes, wood,tools and sandpaper. This toy costs approximately £39.99 (for the latest and best prices make sure you check our retailer list for the Real Power Workshop above). In our review of Real Power Workshop we classed it as being suitable for ages 3 years, 4 years, 5 years but recommend you check the manufacturer specific advice before purchasing.